Huawei has recently entered the tablet market in India as here is another product Huawei Honor X1 Tab from Huawei. It’s a single sim, voice calling tablet with 3G support. Speaking of Huawei Honor X1 tab, it surely seems to turn a few heads by its astounding looks and decent features for its price. 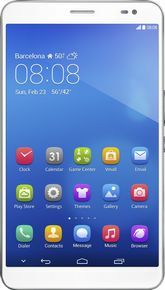 Huawei Honor X1 Tab best price is 18499, available on flipkart.com. And following are the Huawei Honor X1 Tab reviews and specifications. Huawei Honor X1 Tab houses an elegant, sophisticated design. The right edge of the tablet has got the screen lock button, micro sim slot and the volume keys, which makes it common with the other devices. It incorporates a 1.6 Ghz Quad-core Cortex A9 processor with 2 GB ram, which makes the performance a real upstream. The 7 inch tablet has an inbuilt memory of 16 GB which can be expanded upto 32 GB by a micro sd card. The powerhouse of the device is a non-removable 5000 Mah Li-Po battery, which turns out to be the largest in its class to ensure your gadget’s long company for you. Huawei Honor X1 Tab runs on Android OS, v4.2.2 (Jelly Bean). This version of android in upgradable to the latest Android Kitkat v4.4.2. This makes it the most legit device in its class at this point of time.. The tablet includes Bluetooth v4.0, wifi, A-GPS and single micro sim with 3G support. Huawei Honor X1 Tab sports a 13 MP primary camera and with LED flash to strike the light when required, which makes it a great camera. The camera resolution is 4160x3120 pixels. Daylight pictures are fine with an insight on finer details. The 13 MP primary camera also supports 1080p video recording. The 5 MP front camera is really a grace in the class of front cameras which provides hassle free selfies and video calling. The 7 inch display of the tablet is an LTPS LCD display with a resolution of 1920x1200 pixels and a multitouch capacitive touchscreen. The interface is powered by Huawei’s own Emotion UI 2.0 which is pretty user friendly and similar to Android. The display is one of the best in its segment and will pose tough resistance from its rivals like HP 7 Slate Tablet and Dell Venue tablet.